Our Spring Kits feature a custom dual spring capable of turning 12,000 RPM for that added piece of mind (Over-rev/Mis-shift). Our springs are shot-peened for stress relief and interference fit to control harmonic resonance across the rev range. Also in our dual spring configuration, should something happen to one spring, the other can prevent the valve from dropping and causing catastrophic engine damage. Our springs far exceed all other springs we have ever tested, and easily best the Motorsport springs in longevity and performance. These springs are capable of handling much higher lift for even the most aggressive of cams like the Schrick 320°. We can provide all setup data for your engine builder as well. 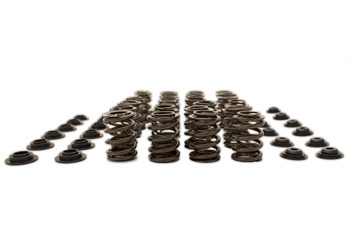 After rigorous testing in some of our test 2.5L Stroker Engines for year after year, these Valve Springs still tests within 2% of their original rate! The reliability and weight savings afforded by the coated Steel Alloy retainers make them a super popular choice with racers and street customers. Our Ti Retainers are the lightest choice for when your racing to win. Due to the nature of Titanium retainers, while they are suitable for a street M20, it is only recommended they be installed in a valve train that will be inspected from time to time. Our Steel Alloy is a great choice for a street or track oriented car that wont have its valvetrain inspected regularly, and still weighs almost half of standard.